But he is facing corruption allegations and a strong challenge from former military chief Benny Gantz. Israel’s Labour Party, which sealed a breakthrough peace deal with the Palestinians in the 1990s, has lost favour with voters in recent years. 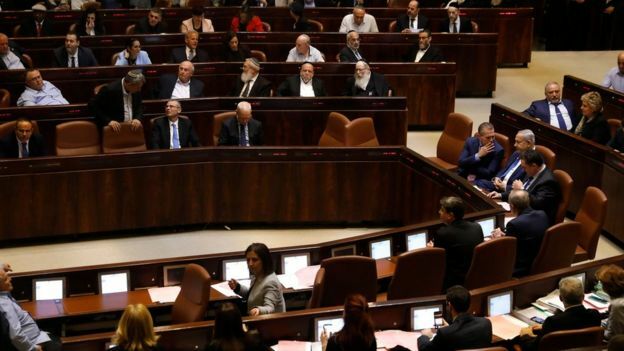 In Israel’s fragmented party system the advantage remains with Mr Netanyahu, who still looks most likely to be able to form a new coalition government, says the BBC’s Tom Bateman in Jerusalem. BBC correspondent says Mr Netanyahu has appealed to Israel’s increasingly right-wing voter base with tough messages on security and a significant announcement in the final days suggesting a new government would annex Jewish settlements in the occupied West Bank. The 59-year-old retired lieutenant-general is a newcomer to politics who formed the centrist Blue and White alliance in February, promising to unite a country that had “lost its way”. The former chief of staff for the Israeli military can rival Mr Netanyahu on security – one of the election’s key issues. While prominent members of Mr Netanyahu’s current right-wing governing coalition openly oppose the creation of a Palestinian state and want to annex much of the occupied West Bank, Mr Gantz’s campaign platform refers to “separation” from the Palestinians – but does not specifically mention them having a state. Mr Gantz’s alliance also calls for continued control over the Jordan Valley and retaining West Bank Jewish settlement blocs. Settlements are seen as illegal under international law, although Israel disagrees. Mr Gantz has promised “cleaner” politics. He told Blue and White supporters in Tel Aviv that the prime minister wanted to change the law to protect himself from prosecution.